..[INFO].. Want to help the environment and save money? 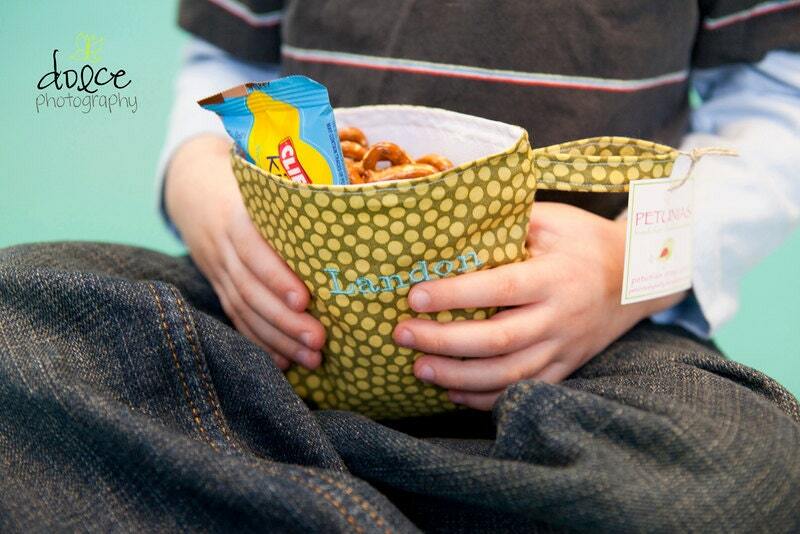 Then invest in this reusable snack bag. 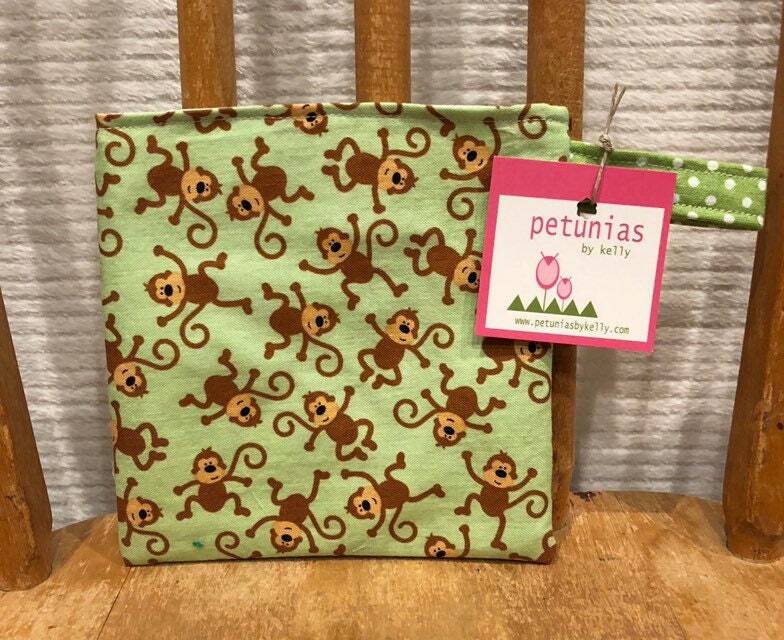 They are 100% cotton prewashed designer fabric on the outside and water resistant 100% nylon on the inside with aplix (softer version of velcro) used for the closure instead of velcro. Our young children can easliy open them to get their snacks! Bag is BPA safe. 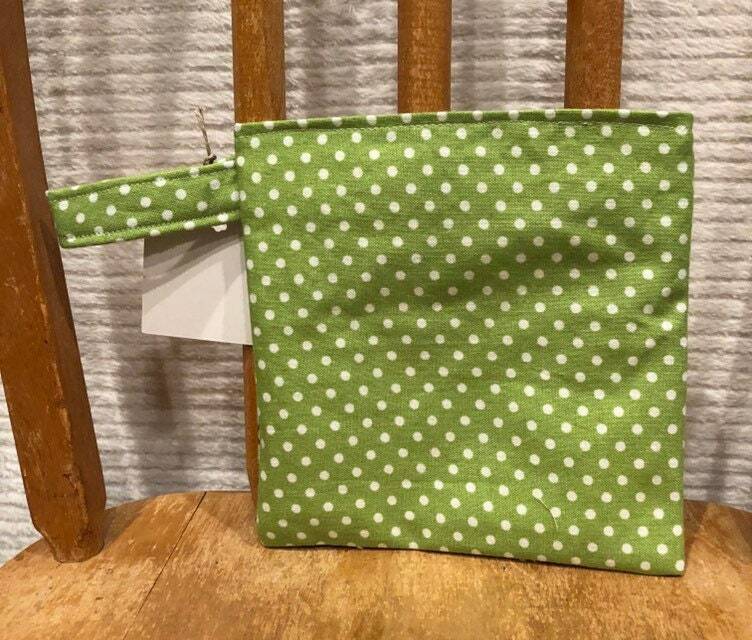 Finished size of this snack bag is a 5" x 5". ..[CONSTRUCTION].. No extra stitching on the outside where the aplix is - nice clean look! All seams are 3 pt. zigzag finished to promote durability. Cute little padded handle on the side to match. ..[CLEANING].. Wipe out inside or machine washable/dryable. 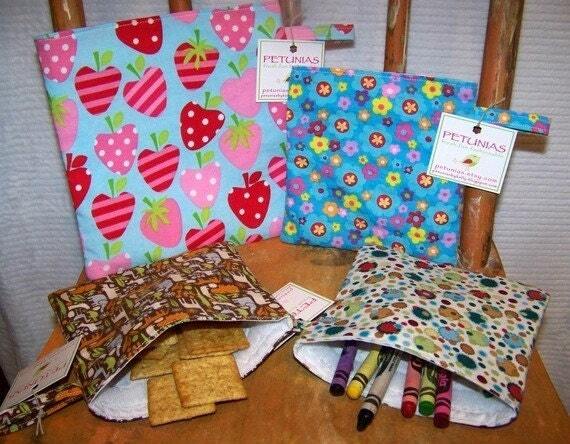 Petunias accepts all payments through PayPal where you can use your debit/credit card SAFELY! If you choose to use the eCheck option through PayPal, I will mail your purchase as soon as I receive notification that the check has cleared. We also accept credit card payments through Etsy. Petunias usually ships Priority or First Class through the USPS. I ship promptly and if I am away on vacation which may delay shipping time I will state the date you can expect shipment in the shop announcement. Shipping charges in ETSY include actual shipping costs plus supply/handling fees (such as etsy fees, paypal fees, packaging costs and gas). I print MOST of my shipping labels through ETSY which includes Delivery Confirmation BUT to ensure delivery confirmation or if you would like insurance or expedited shipping please contact me first. Once the package leaves my hands it is no longer my responsibility, but is then entrusted to the USPS for delivery to you. Customs fees may be determined in each country and are the buyers responsibility. PLEASE NOTE: WE SHIP TO THE ADDRESS LISTED IN ETSY! Please make sure it is correct. Petunias accepts refunds/exchanges on a LIMITED basis. Custom Items are non-returnable! Please contact me immediately if you feel "something is not quite right" with your purchase, and I will do my best to find a happy outcome. If the item is unused and unwashed I will usually refund the purchase price minus the original shipping and handling fee within 14 days from orginal purchase date. Exchanges can be made. As stated above original shipping will not be refunded and additional shipping will be required for replacement items. Reviews/giveaways: At this time PETUNIAS receives thousands of requests for reviews or giveaways. We have chosen not to participate in any of these requests, sorry. I have chosen to use funds from PETUNIAS to donate to WORLD VISION. Thanks for your support!